Poster available for download! See link below. I’m so excited to share my new novel, Tree of Dreams, with you! I’ve been busy preparing some fun resources for book clubs, teachers, and librarians. In designing these materials, I drew on my background in teaching ESL, as well as the many writing workshops I do with students of all ages. Kids and teens in deep contemplation, observing chocolate with all their senses, during the chocolate-tasting I led at the Colorado Book and Arts Festival. I had a blast creating these guides and I hope you have a blast using them! Just click on the links in blue to get to a downloadable pdf file for the guides and jpg for the poster. Grow Your Heart Poster — (see image above). Perfect for your classroom or library, this is a colorful poster encouraging reading, empathy, and connection. Easily downloadable, high-resolution, for up to an 18” by 24” poster. Chocolatey Book Club Party — Ideas on what to serve, how to decorate, what to wear, what to listen to, what to discuss, what to do for fun, and how to get free, signed bookmarks! Literary Chocolate Tasting — Instructions for delicious, fun, literacy-focused activities you can do while eating chocolate! Chocolate Tasting Handout — A printable place mat for chocolate samples, with a chart to record observations about the chocolate, as well as descriptive words to spark ideas. Grow Your Heart Educator Resources — Common Core and STEM connections. Includes book summary, instructions on creating a Grow Your Heart community, pre-reading, discussion, writing, extension activities, and author bio. 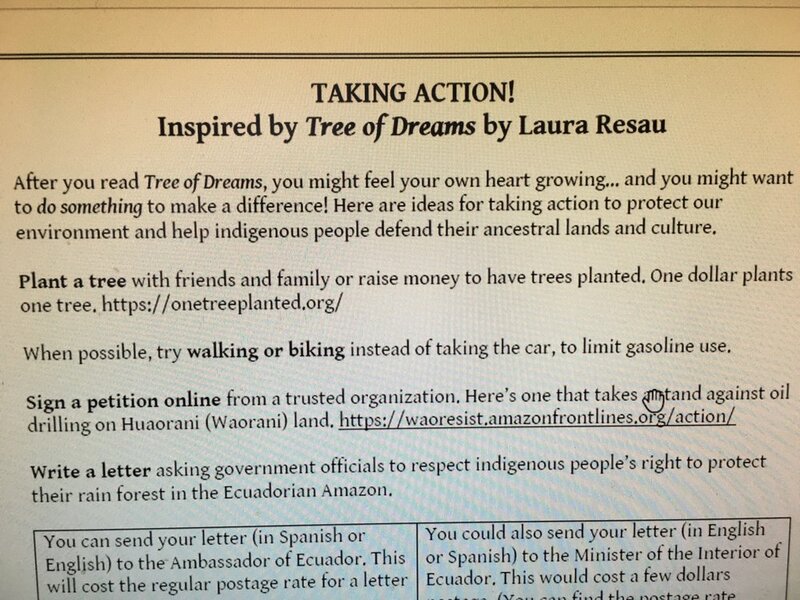 Taking Action— This is a guide with ways to take action to protect our environment and help indigenous people in the Amazon rain forest defend their lands. Includes a meaningful writing activity for kids and teens. If you do end up using any of these guides, please let me know how it went! I’d love to hear your feedback! A STARRED review from Kirkus! This was the first review that came in, and I was over the moon! Another lovely review! This one is from School Library Journal! Thanks for swinging by! You can find more resources, including links to video clips, on the Tree of Dreams page of my website.